My guild's annual Guild Challenge for 2018 was called "Oh My Stars." 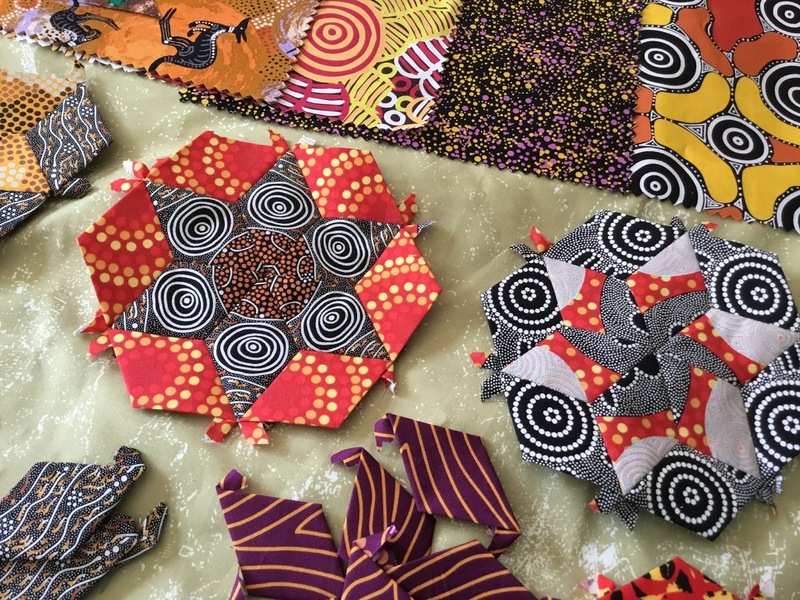 My entry, which won a 3rd place prize, was inspired by Australian aboriginal fabrics [M&S Textiles Australia] and aboriginal Dreamtime designs. 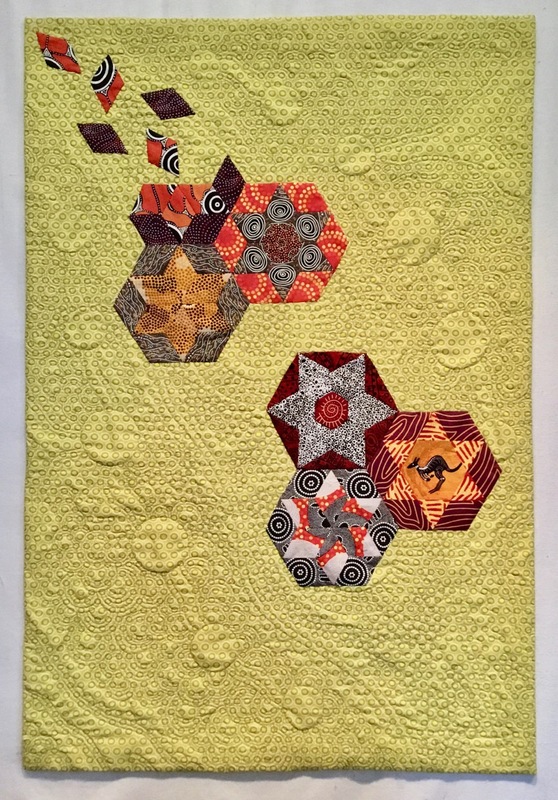 2018 Choo Choo Quilters Guild Challenge by Veronica Hofman-Ortega. 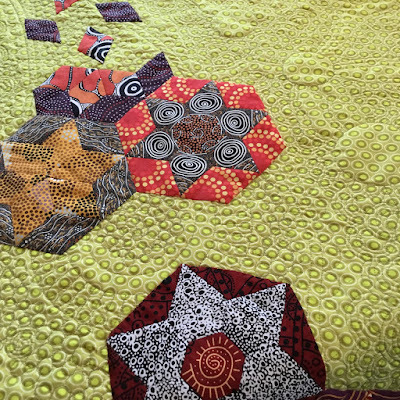 Design: the quilt must have at least three different star patterns. 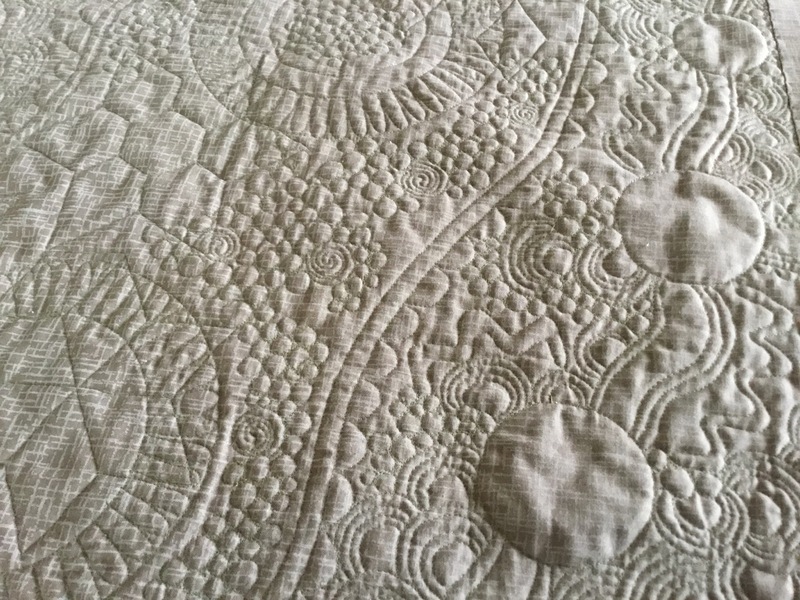 Must be quilted and finished. 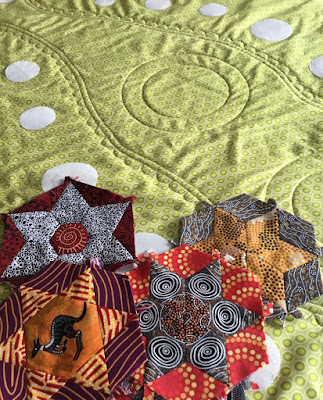 The EPP hexagon stars were hand pieced and the blocks were hand stitched together. I experimented with a few layouts and block placement on a background. The circle patterned fabric was chosen for the background because circles are a major design element and symbol in the Dreamtime designs, and the lime green was the complementary color to the reds and oranges in several of the stars. Auditioning layouts of the stars. 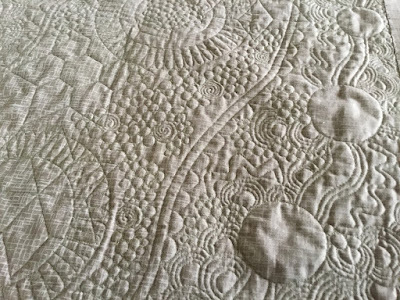 Once the layout was determined, guidelines for the quilting were drawn on the background with a chalk marker. 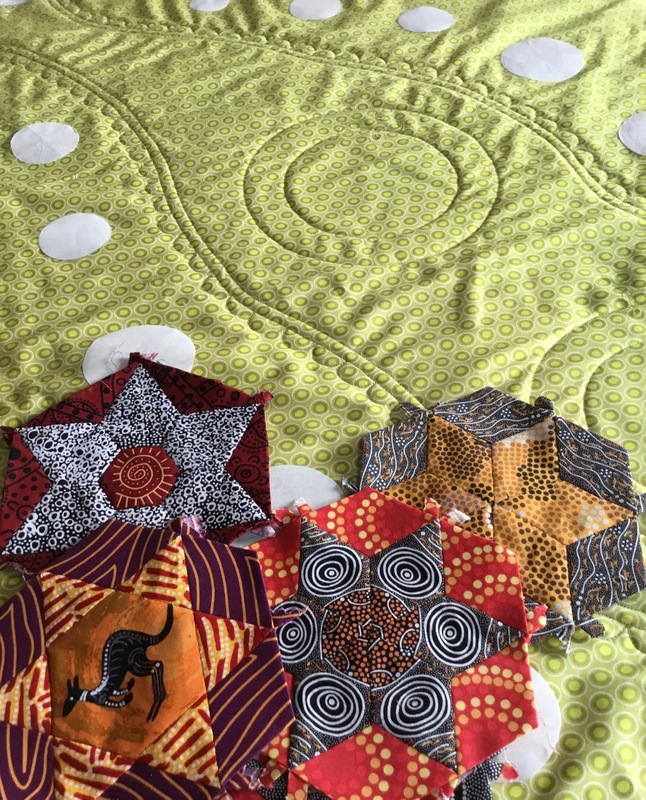 Guidelines for quilting are marked. 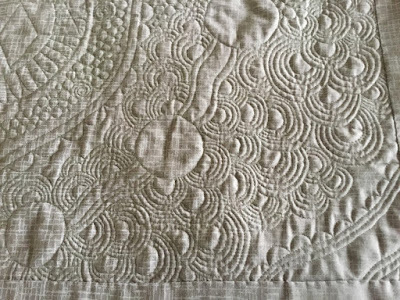 The quilting techniques include walking foot quilting, free-motion quilting and rulerwork. 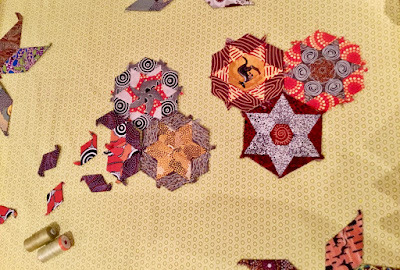 The English paper pieced star blocks were appliquéd to the quilt after the background was free-motion quilted. The stars were then ditch quilted with a 60 wt. polyester thread. 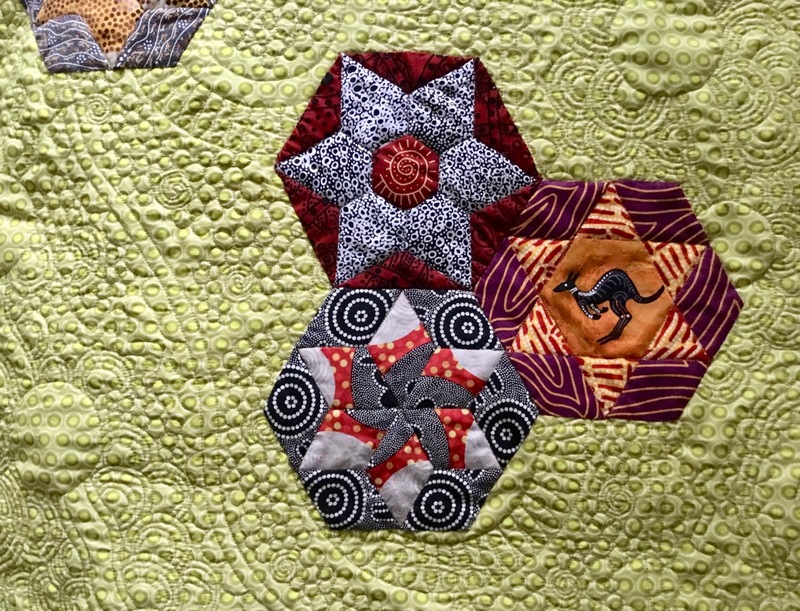 The quilting designs were inspired by the motifs in the Australian fabrics and the story of the Dreamtime designs. For the backing, I used a leftover piece of a 110" wide backing [Westrade Textiles]. The color and value of this fabric made it easy to choose a bobbin thread to match the color of the top thread that was used for the quilting. 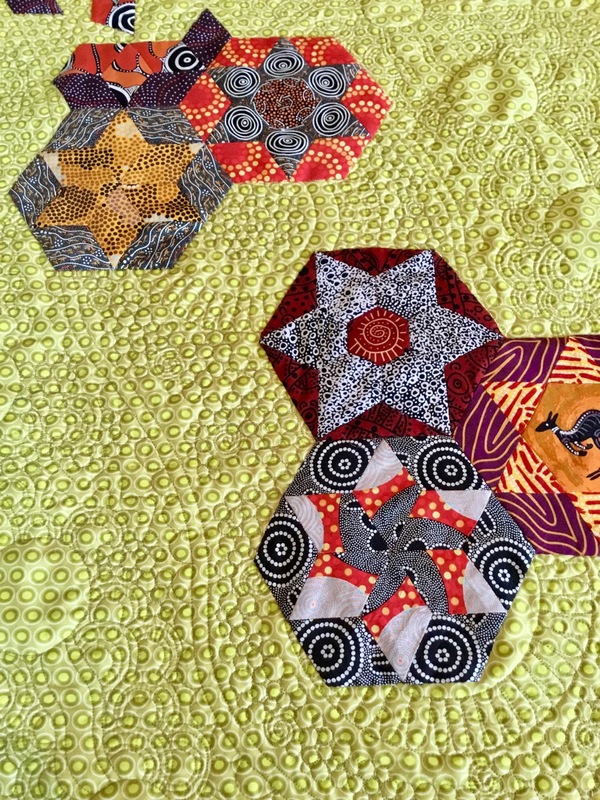 Here are views of the quilting from the back. A facing was used rather than a traditional binding. The same 110" wide backing fabric was used for both the backing and facings. Back detail: free-motion quilting and quilt facings. The finished piece: 26" x 38.5"
26" x 38.5" finished size. 60 wt. poly for bobbin (Bottom Line); 2-1/2 bobbins. 13 hrs. 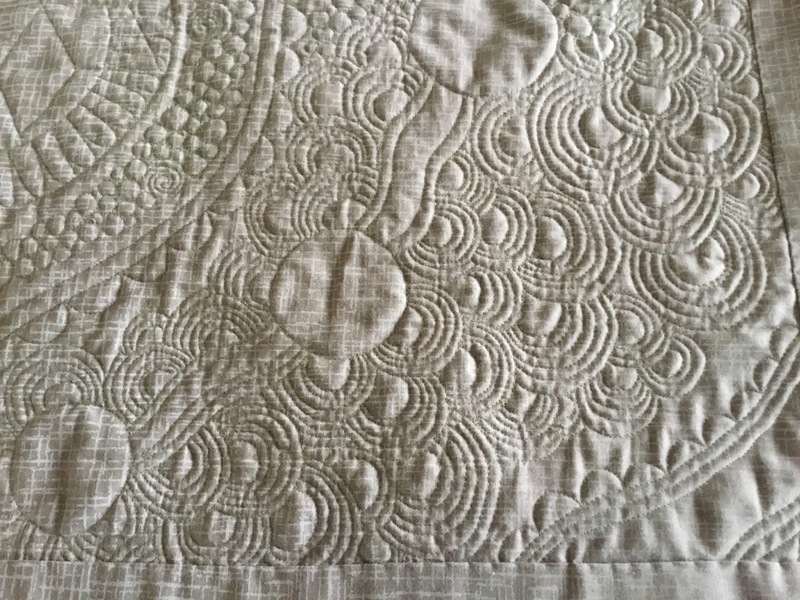 quilting: walking foot (curves and circles); free-motion for background and fillers; ruler work for ditch and outline quilting. Why participate in a guild Challenge? One of the things that my guild does during our Challenge Reveal is to have each Challenge participant give a brief explanation of their piece before the prizes are awarded. Their explanation could be about their inspiration, their thought process behind meeting the Challenge requirements, the trials, roadblocks and successes of the creation process, the materials used, or any pertinent information they feel contributes to the "story" of their Challenge entry. I think you can always learn something from listening to another person's creative path to solving a problem—especially when we were all faced with the same problem to solve. 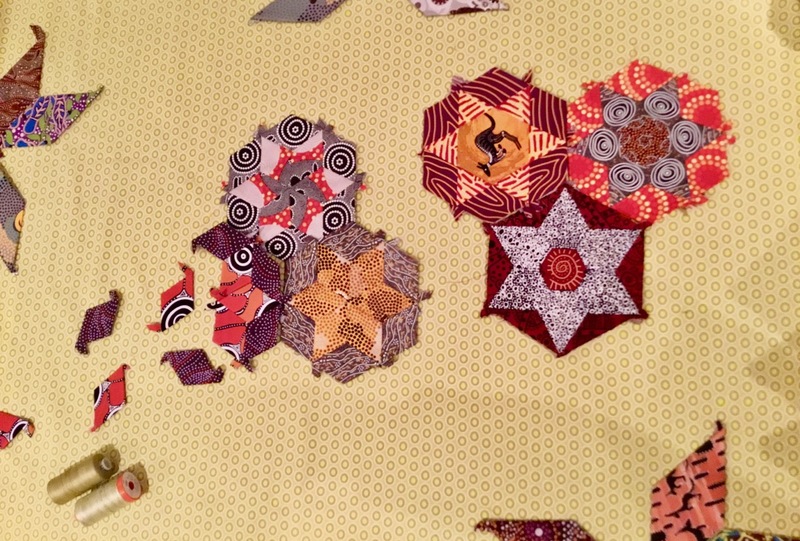 One of our newer members commented that she could never enter a piece in a Challenge. Quick yet gentle encouragement came forth in response. Guild Challenges are a great way to experiment with new techniques and concepts in a safe environment (in the presence of your fellow guild members who support you and your endeavors). You can learn from working on your own piece as well as from what others present. What better way to try new things than a Challenge? You will become proficient and gain confidence by doing. Challenges keep your brain active as you problem solve and research solutions to make your vision a reality. The Challenge Reveal is a "quilt show" we give to ourselves as a guild. It's a well-deserved treat for the entire group! Congratulations to all the Choo Choo Challenge participants! Well done.